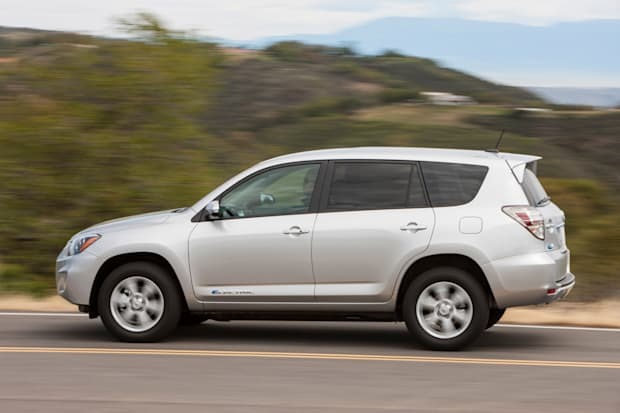 Now into a second calendar year, the Toyota Rav4 EV has been on the market for over 7 months. Sales did slow through the winter months, but now they are picking up again. The speed at which the Rav4 EV is selling becomes more obvious when reading some of the different posts from forum members on the troubles they had insuring their Rav4 EV. Some owners reported having troubles mainly because the Rav4 EV wasn’t in the insurance companies systems – when the insurance agent went to search for the rate cards, the computer returned an error saying it didn’t know that vehicle. Many insurance companies are now set up to insure brand new electric vehicles. Some others said that insurance wasn’t an issue, but titling the vehicle was – the state’s Department of Licensing wouldn’t give temporary tags, so owners had to wait up to 3 weeks for Toyota finance to send the paperwork. Back in September 2012, the first month the Rav4 EV was for sale, there were 61 vehicles sold. That number declined through January 2013, and is now on the rise. For March 2013, Toyota posted sales of 133 Toyota Rav4 EV sales! Although that number is over double the number from the previous month, sales are still relatively slow. Toyota said it would limit production of the Rav4 EV to 2600 units over 3 years – even spread over the 3 years that is 866 vehicles per year. In the first 7 months of sales, there have been 404 Rav4 EVs sold – so 800 could be reached with 5 good months of sales. Since the Toyota Rav4 EV is currently only for sale in California, some customers from out of state have purchased one and taken it back to their home state. The biggest issue with this is that the Rav4 EV is certified for licensing in California, so out of state buyers need to do an out of state emissions control inspection – not that the electric Rav4 should have any issues passing it! nice to see a new article when visiting. Nice writeup. Glad to see the incentives are generating sales. As more people become aware of the Rav4EV it will sell better, especially now that Tesla has cancelled sales of the 40kWh Model S.
This article seems to imply that there will be Rav4 EV sales after the 2600 production units within 3 years. That simply is not true. Toyota is losing a HUGE amount of money on each sale, but they must be sold so that Toyota can sell hundreds of thousands of oil burning cars in California. Currently, Toyota is offering 0% financing and $10,000 off the price, in addition to directly paying dealership employees $500 – $1000 for making a sale. They are paying the dealership a 2% “holdback”. As of May 2013, they are still below target sales just to meet the 2600 total sales in three years, even with these HUGE incentives. These costs are in addition to the $100 million paid to Tesla to produce the drive train ($38,000 per car). Toyota absolutely won’t continue to sell an extremely low production, money losing, difficult to sell car based on a 2012 model year Rav4. They have very publicly made it clear that they like the Prius and hybrids, and do NOT feel that there is a mass market for EV’s. Currently, California Air Resource Board (CARB) requires that Toyota sell 0.79%** of California sales over three years as Zero Emission Vehicles (ZEV). The top six auto manufactures must meet these rules, which is why the Toyota Rav4 EV, Honda Fit EV, Ford Focus EV, GM Chevrolet Spark EV, Chrysler/Fiat 500e, are referred to as “compliance cars”. The sixth manufacturer, Nissan, is not considered to produce a “compliance car” with its LEAF. Over 60,000 have currently been sold around the world and with 2500 DC quick chargers to refuel them. Telsa is currently number 2 with about 10,000 EV’s produced. Both Tesla and Nissan can sell their excess ZEV credits to non-compliance companies. Telsa is reportedly making $25,000 to $45,000 per car just in ZEV credits sold. Thanks for the comments. I updated the text so it doesn’t imply Toyota will continue production after the 2600/3year limit. However, don’t you think California will impose similar rules once this 3 year period expires? Perhaps even requiring a higher percentage be ZEV? Yes, Toyota obviously will do something to meet the next phase of California Zero Emission Vehicles, and yes, the standard does become more stringent. While nobody knows for sure, it appears that Toyota plans to use hydrogen cars. The beauty of using a familiar internal combustion engine and California funded hydrogen refueling stations (as few as there are) is too difficult to pass up. They don’t have to farm it out to Tesla to build. Obviously, whatever it will be, they are working on it now. One thing that Toyota did try, and probably will continue to do, is petition EPA, CARB, and anybody else who will listen that, “nobody wants zero emission cars”. It worked to stop electric vehicles in 2002!!! Unfortunately, that line of BS isn’t playing so well when regulators can point to Nissan and Tesla, both of which have now sold a combined 35,000 cars in the USA and Toyota and the other “Very Large Manufacturers” (except Nissan) can only sell hundreds of ZEV cars. According to this article, they had sold 1600 by April. Even with sales at 133 it will take them 7.5 months to sell them all unless they do a large fleet deal on top of that. in between their promos they won’t sell much I presume. As predicted, production of the 2012-2014 Toyota RAV4 EV ended on 28 August 2014, just slightly less than two years from the first sale. There was exactly one option, floor mats. All cars came with this option. Approximately 2538 total units sold, plus as many as 30 or more test mules / crash test cars. All the VIN serial numbers stated at 1001, however the lowest number known to be owned by a private owner is 1010. The highest serial number known is 3538. As of mid-2016, the cars holding their values quite well on the use market. Until the 200 mile electric cars arrive on the market (2017 GM Bolt, 2017 Tesla Model 3, 2018 Nissan LEAF), and more importantly, an electric compact SUV like the 2018-2019 Teala Model Y shows up, RAV4 EV will likely remain a coveted EV. Re: Engine nois. All RAV4 EVs have it? Re: Suggestion for next EV commuter?